I am officially calling this canvas "done" as I can diddle around and cover it over in gesso and start over for just about ever. This piece features a number of Fashion Graffiti products by Tulip, ephemera and large punchinella from Gauche Alchemy and techniques learned in the Graffiti Chic course I took from Alisa Burke (by the way, all her classes are 10 dollars off right now). One neat thing we do around our house is we have an Art in Progress Corner. 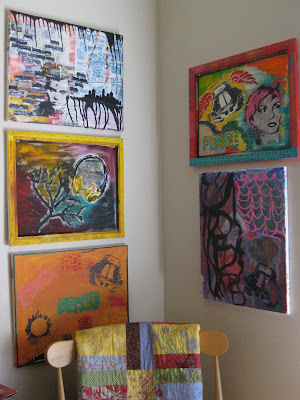 When someone wants to paint they just grab one of the canvases, work on it and then hang it back up to dry. It's really fun watching the area evolve and the colors change as pieces come and go. Plus, it relieves the pressure of having to finish or (even worse) wanting a painting to be "perfect". The whole concept of "in progress" has really brought back the play aspect of making art. Everything I need to know, I learned at the Big Four Concert. Skeptical? Of course you are. Read on and see if you agree. 1. Classic is always perfect. Whether it's a little black dress or Anthrax opening with Caught in a Mosh, you can't go wrong with a classic. This rule applies to everything from sweater sets to appetizers. 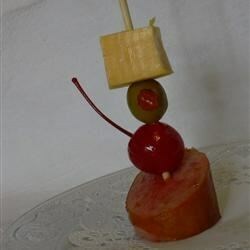 Which would you prefer, the Tasty Toothpick Tower? 2. Scale is Important. Big Guys look great with big accessories. 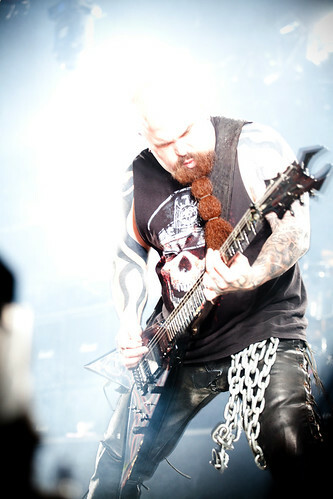 Can you imagine Kerry King in a thin gold chain? Of course not. His gigantic neck would swallow it up. Likewise, make sure your accessories match the scale of both your stature and your look. "It's easy to ruin an otherwise great outfit by choosing the wrong accessories. However, on the flip side, it's easy to make an ordinary outfit look great with the right accessories. " 3. Medical Set-backs are not the end of doing what you love; but you may need to do what you love a bit differently. and here he is, six months later rocking hard in Sofia, Bulgaria. Yes, his head didn't even bob, let alone bang; but he was on stage, entertaining thousands and based on the huge grin on his face he was loving every minute of it. 4. Look people in the eye. Engage your audience. 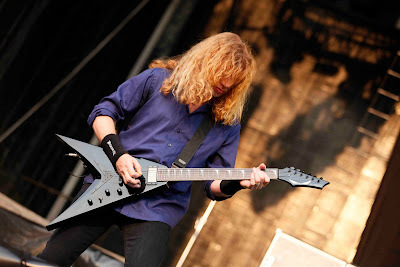 My one small complaint about the Megadeth set is that Dave Mustaine didn't interact with the crowd or even look up. Whether your running a meeting or teaching Sunday School, it's vital to look at your audience and connect with them. Singing to your shoes won't win you any (new) fans. In contrast, Slayer's Jeff Hanneman gives the impression of a really shy guy, he even turned away from the crowd and faced the wall while doing a solo, but he made a strong effort to look at people and engage them. 5. Hedge your bets. An amusing quirk I noted during the Anthrax set was that whenever lyrics would pop up like "go to hell" or "burn in hell", Joey Belladonna would cross himself and make a "just kidding" face. (Perhaps lesson 5.5 is that even rock stars acknowledge the existence/possibility of a Higher Power.) So my suggestion is to fall in love in high school AND go to college. Practice your bass guitar for hours a day AND get a law degree. It never hurts to diversify. 6. Consider Context. Angel of Death (Slayer) was a little hard to handle knowing that they were playing in an area that sided with the Axis power during WWII. Although they managed to save their entire native Jewish population, Bulgaria occupied Yugoslav and Greek territories and had those Jewish people deported to the Treblinka death camp in occupied Poland. I can't say it's a song I would have chosen. Considering context can make the difference between accolades and apologies. 7. Show Respect, pay your respects and acknowledge your influences and inspiration. Some of the best moments of the Big Four concert was when Scott Ian, Lars Ulrich, Dave Mustaine and Kerry King talked about the great bands that came before them (Zeppelin, Kiss, Sabbath and others) and inspired their love of music. There was also a touching tribute to Ronnie James Dio who died of cancer last month. Lars talked about meeting him for the first time when he was ten and how nice he was, how he took time to talk with him and how that experience totally blew his mind. Each of the musicians had great memories of Dio and they were happy to take the focus off themselves and move it to honoring their heroes. As a blogger and a crafter I know that any "new" idea I have is only because I am standing on the shoulders of greats like Crafty Chica, Alisa Burke, Pam Carriker (and so many more). It was a beautiful and touching reminder to acknowledge and honor those influences. 7. Be Yourself. 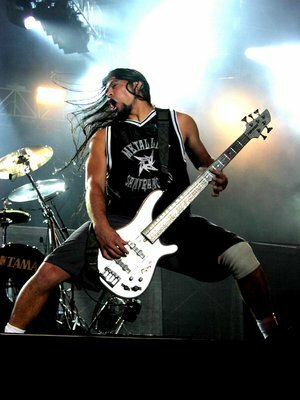 Rob Trujillo is awesome in his weirdness. I loved him in Suicidal Tendencies and I LOVE him in Metallica. That said, I was really worried that he would be consumed by Metallica and stop being so strange. I am pleased to report that he's still letting his freak flag fly. Sure, his jersey is black now - not red or green or white - but his essential Rob-ness is intact. No matter how cool a group you join, don't forget it's made better by your uniqueness. Don't be a sheep. 8. Time heals all wounds and no hurt is so great that friendship can't overcome it. Seeing Dave Mustaine and James Hetfield standing shoulder to shoulder, guitar to guitar, was such an incredible, unexpected Kumbaya moment that it gave you faith in humanity. There are literally thousands of posts this morning that start with, " I never thought I'd see the day...". It made peace in the Middle East seem possible. "This shows the power of brotherly love and forgiveness,"
I thought I'd end with a clip of the landmark moment when representatives of all four bands played together. I doubt it's work safe due to language (consider yourself warned!) Hope you like it. So there you have it, life lessons from the Big Four concert. Do you like the idea of making double batches of your favorite casseroles but wonder how to store them without investing in a gazillion pans or even worse, disposables? This is the best way I've found and we've done it for years. Line your baking dish with aluminum foil making sure to tightly seal any seams. Have at least an inch hanging over each edge. Spray with cooking spray and make your casserole. Place in the freezer and freeze over night or until solid. Take out of the freezer and lift out the casserole using the foil as a handle. Take a second piece of foil to cover the top and seal completely. Label. Wash and return your dish to the cupboard and your wrapped casserole to the freezer. When you want to have that dinner, find the right baking dish, spray with cooking spray and peel the foil from your casserole - thanks to the cooking spray it releases easily. Pop your perfectly-sized meal into the dish and cook/thaw as directed. 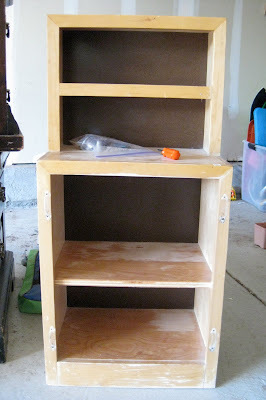 This saves you from buying a ton of baking dishes and stacks very nicely in your freezer. You can reuse the piece of foil from the bottom of your casserole to cover your meal during baking - it's usually very flat and is still good to use. If I had a prize winning recipe, this one would be it. It really puts all other coffee cakes to shame - seriously, they cower in humiliation. I think the Boom-Boom-Pow is all the coffee both in the batter and the crumb; yet it tastes mild enough that our kids liked it as toddlers. Yumm-O! I made it for Chris for Father's Day and we all have very happy tummies. Don't be appalled by the numerous steps, this cake, while not quick, is fool proof and so delicious you'll forget the effort. Make crumb topping: Stir together dry ingredients, cut in butter, add chocolate chips and nuts. In a large bowl beat sugar and butter until light. Add eggs, then sour cream and then coffee dissolved in water. In a small bowl whisk together dry ingredients. Gradually stir into moist ingredients starting with 1/3 of dry mixture, ½ of milk, 1/3 dry, ½ milk final 1/3 dry mixture. Spread half of batter into pan. Sprinkle with 1 ½ C of topping. Cover with remaining batter and finish with crumb topping. Cool and drizzle glaze off a fork onto the top of the cake. Notes: I like this cake warm, but my family prefers it after the flavor has blended a few days. To make sure it's still fresh, moist and flavor-blended; I bake the cake, cool it, glaze it and then freeze it for a day or two. The night before I take it out to thaw and it's just about perfect. 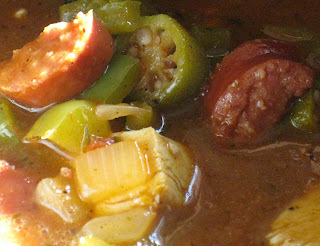 The original recipe I had for Gumbo-YaYa (a gumbo and jambalaya hybrid) took two days to make. As much fun as that is (*not*), I quickly shaved a few hours off here and there until I had my current virtually identically flavored recipe - that takes about an hour. So if you're in the mood for some slow food, give this a try. Add oil, whisk in flour and then 1 1/2 C of broth. Stir over med. Heat for ten minutes until roux turns dark brown. Add kielbasa and remaining chicken stock. Bring to a boil, reduce hear and simmer uncovered for 20 minutes. Stir occasionally until vegetables are tender and liquid thickens. Serve on rice. Pass hot sauce. Did you hear that the Etsy Inspired Challenge is doing a DT call right now? They're a super-cool group of gals - you should totally apply! 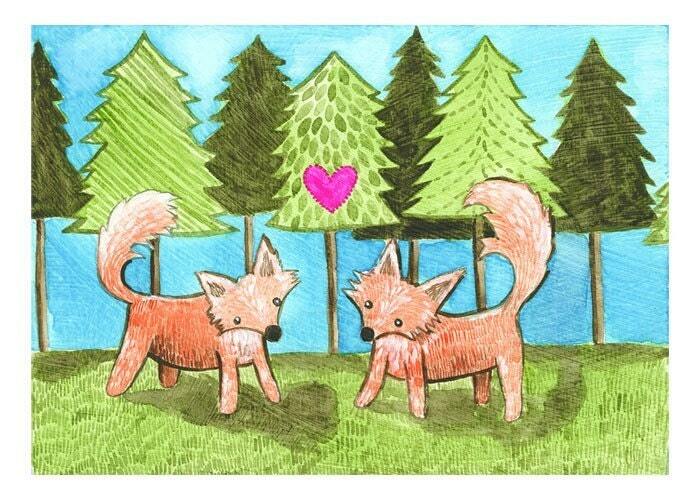 I tried to keep with the painted vibe going on here, the hearts and the trees. Living in Utah, the land of the big families, yard sales are knee deep in discarded toys. When I saw this wood play stove I just had to have it. Fortunately it met me five dollar price point too. I already took the doors off in this before picture (sorry) but as you can see, it had seen a lot of hard use. After sanding it I Mod Podged some of my kitchen fabric to the doors, painted the hardware brushed nickel (it was dark brass) added new nobs and painted the whole thing turquoise. 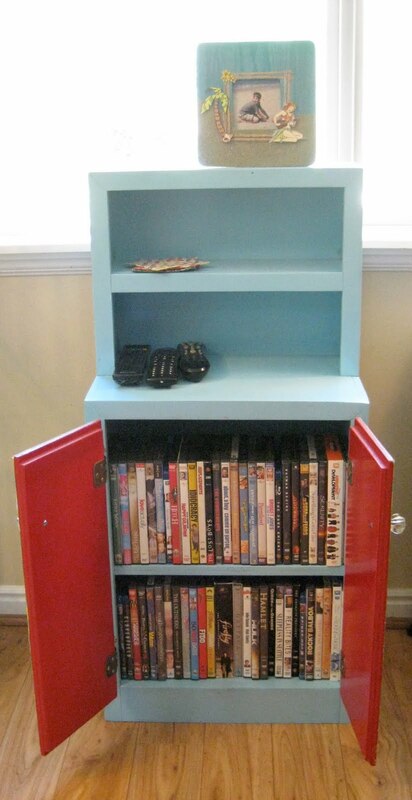 Now I have a cute little storage piece for remotes, DVDs, coasters, kleenex - all the stuff that accumulates in the living room. P.S. I'm going to add some legs to it as soon as I find something I love.